Fishing is an amazing pastime to say the least. If you are like most people who fish you find it to be fun, challenging, relaxing and a great way to bond with family and friends. It also is a sport that takes skill, technique and can be very demanding at times. There are so many types of fishing and each one will require you to master certain skills. The only problem is all the skill in the world will not matter if there is no fish in the area of a lake, river or ocean where you are fishing. That is why it is so important to have a good fish finder on your boat. What is the best fish finder? That is an easy question to answer. It is a fish finder that is accurate and will get you to an area that has a large fish concentration in a hurry. A good fish finder will help you with such things as lure selection, line weighting and even help you determine what type of fish you are most likely to catch on a particular day. How Does A Finder Work? You may be like many anglers and wonder just how these amazing fishing devices you have heard of work. There is nothing magic about them they just use simple science to give you a better chance at having a successful fishing adventure. They are a device that uses sonar waves to help you determine when fish are present. They have a receiver unit that is much like a computer screen that is placed near the pilot area of a boat and a transmitting unit (called the transducer) that is installed on the bottom of your boat under the water line. When the fish finder is activated the transducer starts sending out sonar signals which are sound waves that will travel until they hit a solid object then reflect back. The timing of the reflected sound wave coming back is how size of an object and its distance away is determined. It is the same type of technology that the military uses to find enemy submarines. The sound wave information that is reflected is then displayed on the screen that is mounted near the pilot area of the boat. Not only can this information help improve your fishing but it can also alert you to such hazards as rock outcroppings, shoals and rapid depth changes underneath your boat. As we mentioned before the only thing that a fish finder will really indicate is the concentration of fish in an area and the approximate size of those fish. It cannot tell you if they are bass, pike or salmon; but these things can be determined if you know the indigenous fish habits of the area you are fishing and combine that with the fish finder information. This is a myth. Sonar is sonar. Whether the water your boat is in is shallow or deep the sonar will go down and hit an object and send that information back to you regardless of depth. Once again sonar is sonar. When a sound wave is sent out from the transducer it will travel until it hits something that will reflect the sound wave back. A fish finder is not foolproof but it’s a pretty good bet that when you are getting small sonar hits there is fish under your boat. They are very accurate in a majority of the instances they detect the presence of fish. Fish finders come in all shapes, types, sizes and price ranges. With as popular a pastime as sport fishing is you can imagine just how many choices you will have in the marketplace. Make sure you take a look at the key attributes of any fish finder you are thinking about buying before you make that purchase. It can make a huge difference in purchasing a fish finder that works great and leaves you happy you spent the money on it. The best fish finders are not always the most expensive ones so don’t be misled by price. It may be a good indication though of what features that a fish finder has that may be useful to you. You should set a budget for the amount you are willing to spend on a fish finder before starting your search too. This will keep you from wasting time looking at ones that are out of your budget range. A fish frequencies power is displayed in watts. You may wonder what this has to do with a fish finder you are thinking about purchasing. It is actually a very critical factor in determining fish finder quality. The higher the wattage a fish finder has the faster the signal of what is in the water under the boat gets back to you; that means the higher the wattage on a fish finding unit the more accurate and up to the second the information is that you are receiving on the display. So make sure you do not underestimate the importance of wattage when it comes to making your fish finder purchase. The more frequencies a fish finder has the better versatility it has as far as helping you find fish. High frequencies (192 KHz and 200 KHz) are great for using in shallow water and lower frequencies (such as 50 KHz) work best in deeper water. The number of cones and cone angles are also important too. The more cones the more area coverage underneath the boat you can detect if there is fish there. The number of frequencies and the cone angle are two things that are very important to consider when shopping for fish finders. The more screen resolution your fish finder display has the more information it can display for you. The more information you have on the fish around your boat the belter decisions you can make on how to catch them. Also a color display is usually better than a black and white display in most cases too. This is an excellent starter model fish finder that is not expensive at all. It has everything you need to learn how to use a fish finder and ultimately start catching more fish. If you like to fish but are doing so on a fixed budget then this neat little fish finder may be just what you need to have a better fishing experience at an affordable price. It is a dual frequency fish finder that will provide you with enough detail to catch fish in either shallow or deeper water. It also has a decent screen resolution so you can see fish and other important details about the surroundings your boat is in. It will even help keep you safe from shoals and other water hazards as you are fishing or boating. 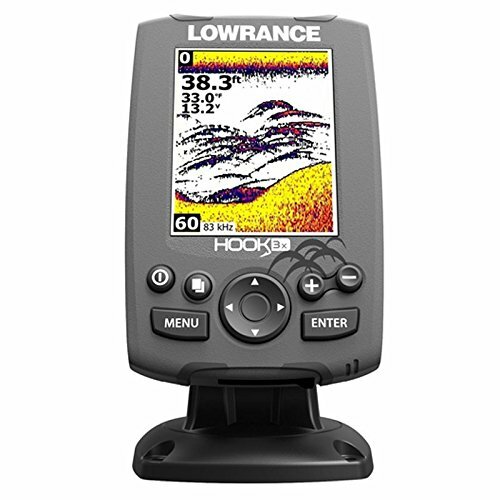 One of the nice things about this Lowrance model fish finder is it needs very little adjustment as you are using it. It also features a nice 60 degree cone angle for giving you a wide searching area under the boat. Garmin is a big name when it comes to fish finders and they do not disappoint with this very efficient model. It is not the fanciest of models you can buy but if you are looking for a good fish finder at a decent price then this one cannot be beat. It will get you to the areas that you will have the best chance at landing some good sized fish. It features an 8 level greyscale monitor that works almost as good as a color monitor without going to the extra expense. This fish finder has a good enough resolution to give you a near photographic look at what is swimming around underneath your boat. It also features both 77 KHz and 200 KHz frequencies which make this fish finder ideal for looking for them in both deep and shallow water areas. There really is a lot of versatility built into this very affordable unit. Having the transducer included is a nice little bonus also. The transducer that comes with this model will mount on just about any type boat except a pontoon boat. It is a good model transducer that will allow you to scan a generous amount of area under your boat for fish. It is a fish finding unit that does not take up much space when mounting and is very easy to learn how to operate too. It is a perfect buy for the first time fish finder user or fixed budget fisherman to say the least. 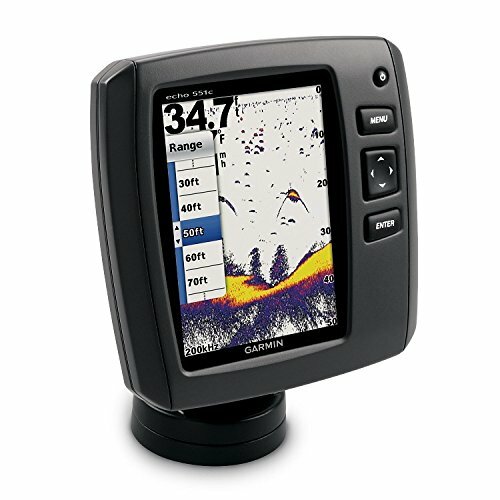 This is another great fish finding product made by the very reputable Garmin Company. It is a very versatile fish finder that should help you easily find fish in all different scenarios. A fish finding device like this one can really add to your chances of having an enjoyable fishing experience. The resolution on the full color monitor is VGA quality and will give you a lot of the detail you need to catch fish right on the screen. It is a dual frequency system that will help you find fish in both shallow and deep-water conditions too. 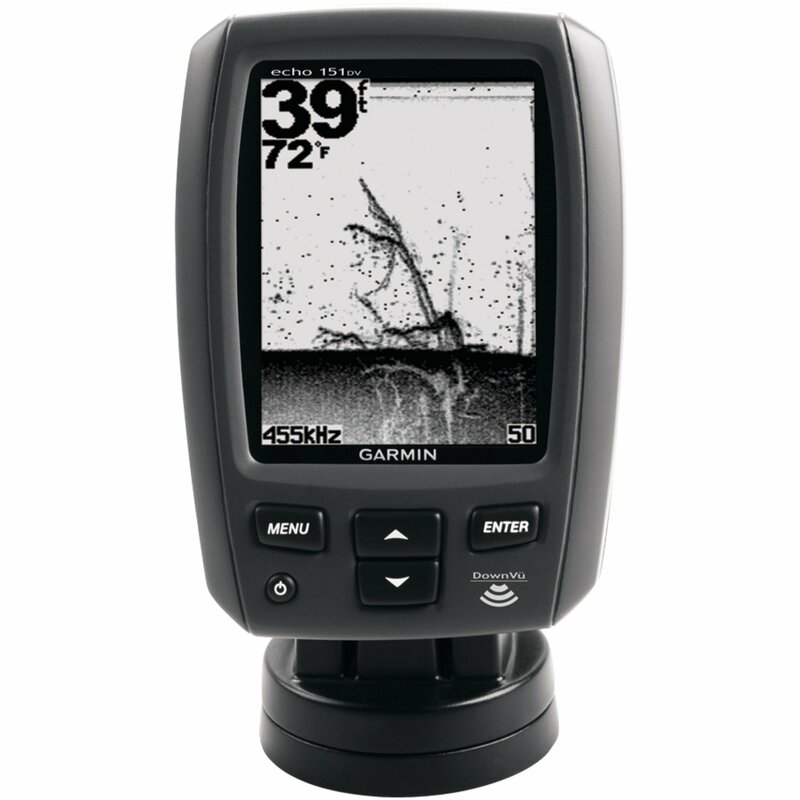 This Garmin model fish finder also features a large signal cone which makes it easier to see fish located not only below your boat but off to the sides of it too. This is a very high quality fish finder for the price. 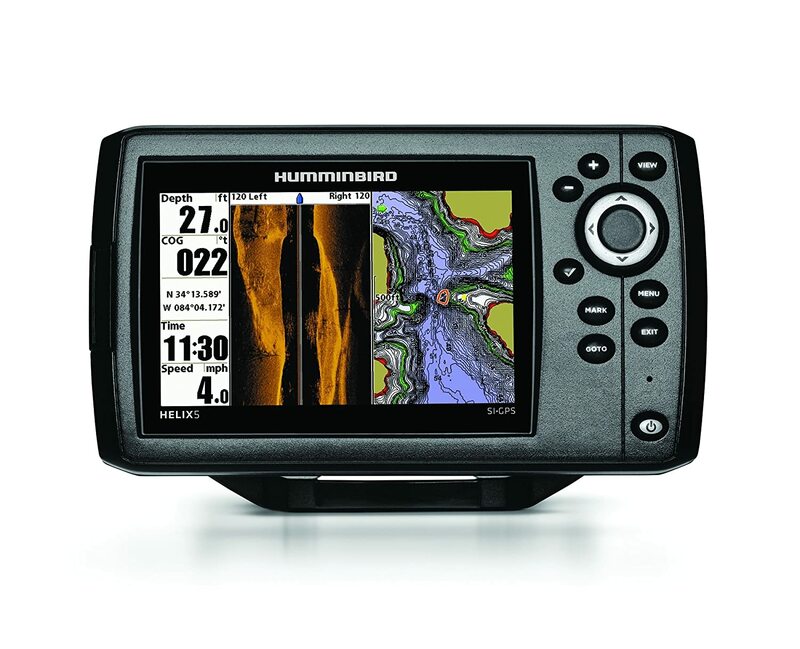 If you are the type of fisherman that likes to buy fishing gear that is the best regardless of the cost then this great combination fish finder and GPS is just right for you. It is an elite level fish finding model to say the least. The excellent features on this fish finder start with the screen resolution; it’s one that is better than standard VGA quality resolution. It also features a wide cone angle that will give you a 360 degree view all around the sides of your boat too. It comes with frequencies that will give you great detail in both shallow and deep water too. The GPS is a huge bonus and with its memory you can upload current navigational maps and mark waypoints of your favorite fishing spots. Having a GPS on board means you will never get lost even in the worst weather conditions and it will also help alert you to navigational hazards that are present in the area you are boating in. It’s your choice. Come back home from the day’s fishing with an empty stringer or a hearty meal. A fish finder can really make that much difference in your fishing excursion’s success. We asked the question before what is the best fish finder? That is hard to say but a medium priced model like this one that can do a lot is an excellent first one to purchase. So try one out to see if you like it. It just may change all your fishing fortunes for the better on a regular basis.